Manchester 235 put on a show and a half for another North West One regional final. 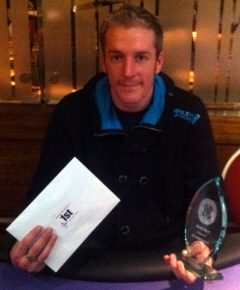 Five more players from the Lancashire area would be one step closer to becoming the new UK Pub Poker Champion. Last season’s winner, Howard Dawber, was back to defend his title but exited in 85th position respectively. Last season’s Team Event winners were soon eliminated with their play-off winner Will Davenport being the second player eliminated on the day. The outstanding venue came in the shape of the Blue Bell in Manchester who had two finalists on the day and another top 20 finish. 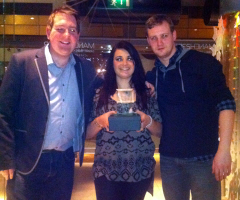 Our congratulations go to league champ Steve Murray, Danielle Maxfield and Gavin Pennington. As the final table got under way, it was, as expected, the two big stacks who were looking the most dangerous. With only five National Final seats available, there were still going to be five slightly disappointed players. First out was one of our Team Event heroes Steve Murray. Steve was swiftly followed by Anthony Reel, Neil Cox, Anthony Gilderdale, and the second Blue Bell finalist Gavin Pennington. With all remaining players through to Nottingham the atmosphere was a lot more relaxed. We were soon down to the heads-up stage between our two earlier big stacks, Andrew McMillan and Ian Vayro. The final hand saw Ian put in his remaining stack with 9-7, only for Andrew to hold A-3. Andrew smashed a flop of 6-A-3 for two pair and while Ian had some hope with a 6 turn, all hope was soon lost when a Q hit the river to make Andrew McMillan our new North West One champion.